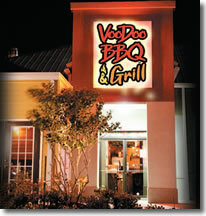 If you are looking for information on the VooDoo BBQ & Grill franchise business opportunity, VooDoo Barbeque & Grill franchises or VooDoo Barbecue & Grill franchising , then you have come to the right place. Be a part of the Hottest Concept in the BBQ Industry! 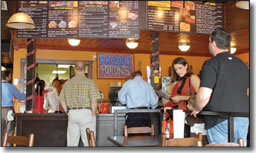 Voodoo BBQ & Grill has put a "New Orleans Spin" on slow smoked meats and fast, casual dining. The premium quality Beef Brisket, Pulled Pork, Louisiana Cajun Sausage, Chicken, and Ribs are smoked over Louisiana Pecan and Oak woods for up to 18 hours then blended with Cajun, Creole and Caribbean spices to create the magical flavor of "New Orleans Style BBQ" unique to VooDoo BBQ. One of our sayings, "Taste Our Magic", is one that sits unique along with our cuisine. What really sets our food apart in the BBQ industry is not only our commitment to our proteins but our equal commitment to phenomenal side items. At VooDoo BBQ we don't look at our side items as window dressing. Our Corn Pudding and "Gris Gris" Greens are just two of the signature side items that keep our guests coming back for more. Our enormous overstuffed potatoes, entrée salads, burgers and desserts such as our famous New Orleans style Bread Pudding provide a complete menu selection for everyone, not just the BBQ enthusiast. All this and more are available at a very attractive price point for our guests. operating your store is a team effort. 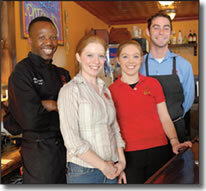 The process of opening your restaurant begins the moment you join the VooDoo BBQ team. Management Training - You and your key managers will participate in an intense training course for four to six weeks at our headquarters in Baton Rouge. Operations Manual - During training you will be given our detailed manual that covers a wide array of topics key to operating your restaurant. Site Selection - We will assist you in selecting an approved location and assist in lease negotiation. Equipment and Inventory Ordering - We will provide you with a listing of all required and approved equipment from our authorized vendors and help you order your initial food, dry goods and bar inventory. Store Opening Training - Our store opening team will be on site with you several days before you open to help you set up your store and train your staff. We will stay with you for several days after you open to assist in the transition. Once you open we provide on-going support to help you operate effectively. Field Support - Our field support team will periodically visit your store to meet with you and provide operational evaluations. Research and Development - We are committed to serving a superior product which requires that we regularly research ways to make our existing items better and new items and ingredients to add to our menu. Continuing Education - As needed we will provide on-going training to introduce new operating methods and menu items.